It’s okay for backgrounds to be messy! On this page, I applied several shades of Distress ink and Distress Oxide ink to a craft sheet, spritzed it with water, and then pressed my book pages into the wet ink. I dried the page, and then dabbed it into the wet ink droplets again, repeating until the spots were layered in a way that was visually pleasing. I also used blending tools to rub black ink onto the edges of the page, which seems to give a page a finished look. 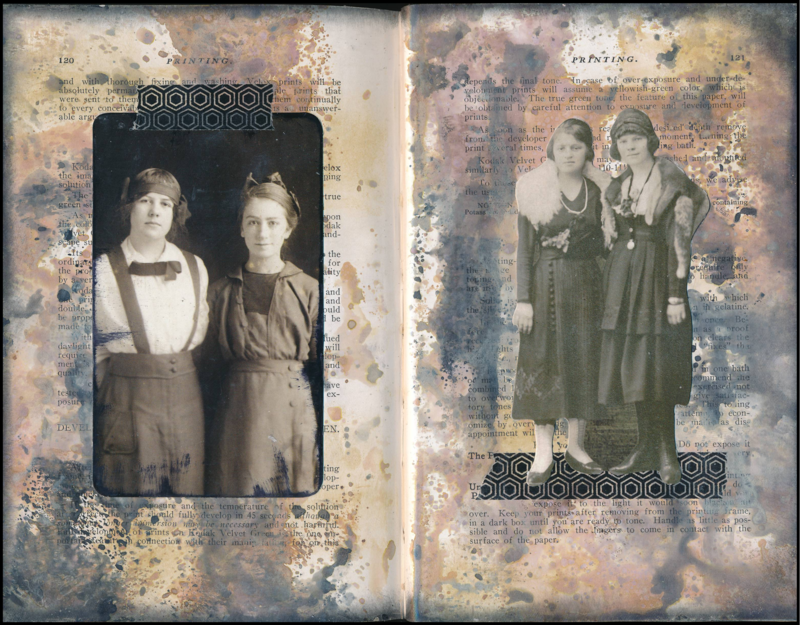 The Tim Holtz images I added to the left and right were adhered to the page with double-sided tape, and then visually anchored with washi tape strips. This page is simple, but effective. And I like the darker background (which is different than most of the pages in this art journal). Love vintage…..Love those colors…..Really well done…..